Fortress open to the winds: Indonesian keyboard player finds definitive fusion of elements to conjure up passion and discipline. 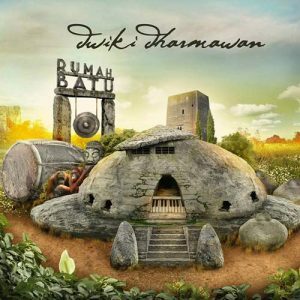 A follow-up to “Pasar Klewer” and a close relative of “The Stone House” with whom it shares title, translated into Bahasa, and a rhythm section, this album is different from both of them. Confined to a single disc, Dwiki’s third release on MoonJune possesses immense inner freedom and, despite its Spanish provenance, proudly wears Indonesian colors with regards to form and content. Weaving together traditional motifs and original pieces to create such complexly layered pieces of slow enchantment as the two-part “Rumah Batu Suite” that see the entire ensemble – featuring the aforementioned unit of Yaron Stavi and Asaf Sirkis – contributing to which enriches every moment’s emotionality to endless extent. And still, it’s more often than not is inherently ruminative because the record’s driving force – a delicate one – will always be Dharmawan’s piano, helped by flute on “Janger” and “Rintak Rebana” before their acoustic pastorale gets an electric shock and not only intensifies but also splinters up in a multitude of silver slivers as Nguyên Lê’s guitars alternately rage only to retreat to soundscapes later on, while the ivories veer off from the main course as well. Passed over to “Paris Barantai” – a glimpse of the album’s European link – this dynamic amplitude has mesmeric vocal line to pacify instrumental storm until six strings turn it into pellucid fusion, whereas the simmering and shimmering of “Impenan” – meaning “Songwriting” – revolve around Dewi Gita’s unhurried prayer. Uzbekistan-bound “Samarkand” seems the rockier number of all, with Carles Benavent’s bass bringing funk to the riff-spiced mix, yet the gentle ruffle of “Selamatkan Orang Utan” should find the artist at home. That’s what “Rumah Batu” is: a return to his native land after a trip all around the world. A heartwarming work.